I’ve found a few old pictures which I had failed to add to Hull Photos earlier, and have now put these up with some brief descriptions on the site. I will also be updating the site with the comments on all the pictures I posted during last year, hopefully with the corrections made by a number of Hull people on Facebook. Feel free to keep making corrections or additions here if you know things I’ve got wrong or have not mentioned, either to any of the posts here or on my Facebook page. Here are the first 7 pictures in the ‘Old Town’ section of the site. I decided to include those from Humber Dock and Railway Dock (now Hull Marina) in this section rather than in the Docks section. 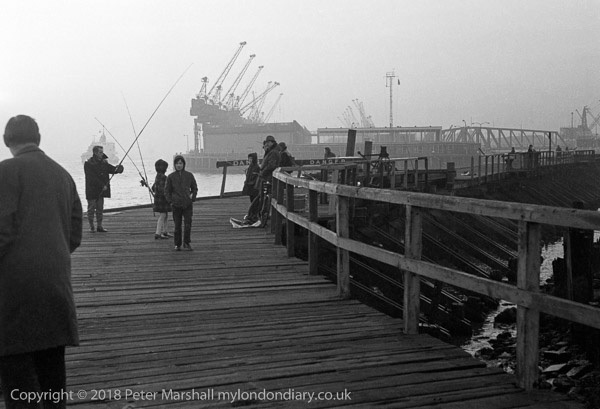 People fish on a foggy day from a pier to the west of Humber Dock Basin with the entrance to Albert Dock with its swing bridge in the right background, and two rows of dockside cranes. The Sykes’ Head at 2 Wellington St had been The Steam Packet pub from around 1813, but changed its name around 1840. More recently it was the premises of Ryehill Growers. 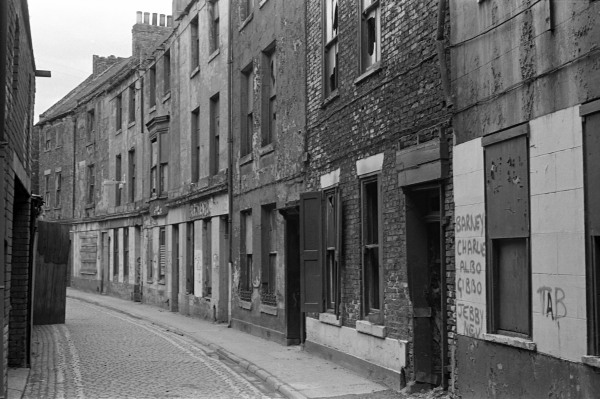 This row of buildings was all demolished and the area became a car park, awaiting further development around 10 years ago, although it was mentioned in the 2005 Hull Council Conservation Area Character Appraisal as being “of historic townscape value“. 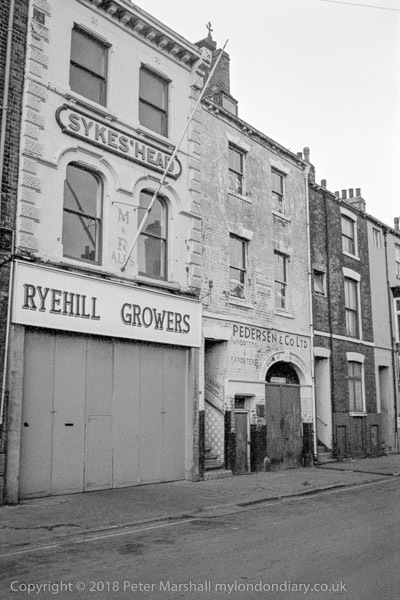 Fruit, Vegetable & Potato Merchants Ryehill Growers still trade from other premises in Hull.Pedersen & Co Ltd Importers and Exporters proudly state above their doorway ‘Also at Billingsgate’ probably a reference to the Hull fishmarket rather than that in the City of London. In 1975 there were still two ranges of tall warehouses alongside Railway Dock, the smaller 3 days at the east which are still there and a rather fine range of seven that were sadly demolished shortly after I took this picture, The long railway goods shed alongside Railway St at the east side of Humber Dock was then occupied by Flying Dutchman Antiques. Much of the dock was silted up with mud from the Humber. Water washes over a vessel at the entrance to Humber Dock Basin at the end of the Minerva Pier. Above the entrance to the lock leading to Humber Dock can be seen the fine seven bays of warehouses by the west end of Railway Dock. 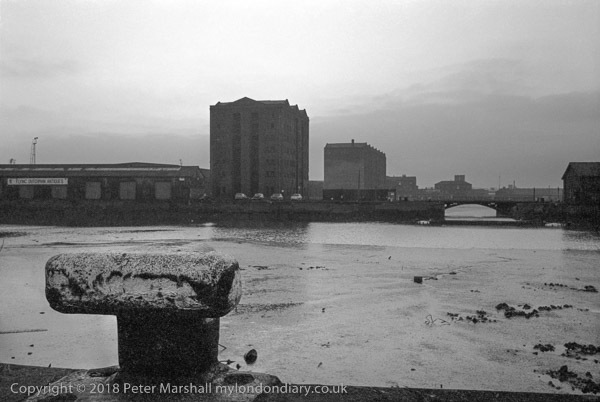 The bridge leading to Island Wharf at the left has gone, but it can still be reached as a part of the Albert Channel (also known as Paraffin Creek) has been filled in. 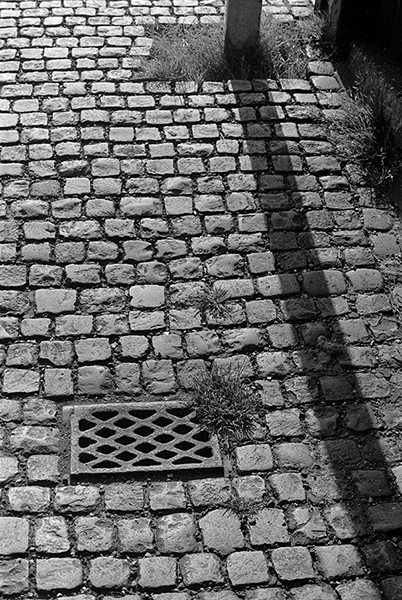 Cobbles by the side of the dock, between it and the sheds around the dock, with a drain and the shadow of a post. Humber Dock was approved by an Act of Parliament in 1802 and completed and opened in 1809. 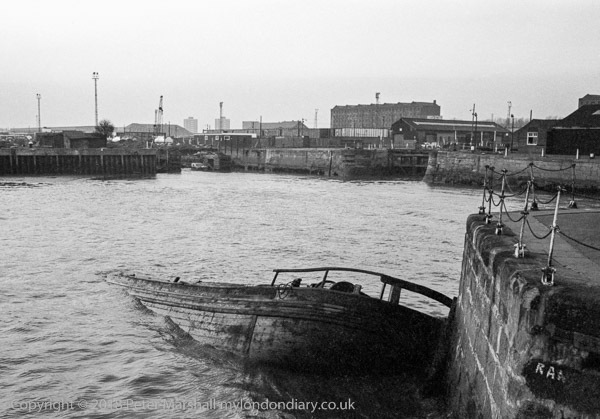 It closed in 1968, re-opening in 1983 as the Hull Marina. The weeds had grown in the nine years after it was closed. 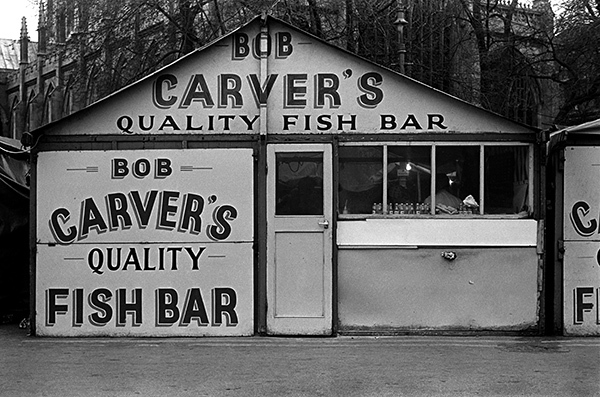 Bob Carver’s Quality Fish Bar in front of Holy Trinity Church in the Market Square (the square is now Trinity Square, and the church is now Hull Minster) was a popular place, serving some of the best fish and chips in Hull. Bob Carver’s was established in 1888 and is still going, though not in this building, but a few yards away at 9 Trinity House Lane, part of the listed building which includes the Indoor Market. Some say the quality is now nothing like that from the Market Place stall. This entry was posted on Monday, January 8th, 2018 at 09:37 am and is filed under Hull Photos, My Own Work. You can follow any responses to this entry through the RSS 2.0 feed. You can leave a response, or trackback from your own site.